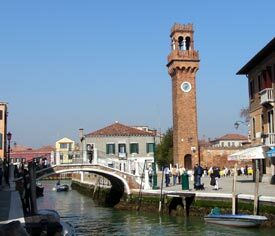 ABOVE: This medieval campanile or bell tower dominates the Murano skyline. INSET BELOW: A glassblower demonstrates his craft. Glass has been made on the islands of the Venetian Lagoon for at least 1300 years. The industry had its beginnings on Torcello in the 7th or 8th Century; production later shifted to Venice, where it remained concentrated until the fornaci or furnaces were moved to the island of Murano as a fire-prevention measure in 1291. Today, "Venetian glass" is a synonym for "Murano glass," and the island's glass industry is enjoying a resurgence under a new generation of master artists and craftsmen. If you're even remotely interested in the history and art of glassmaking, spend 30 minutes to an hour at the Museo Vetraio or Glass Museum in the center of the island. Murano also has two historic churches that are well worth visiting (especially the Basilica di Santi Maria e Donato with its beautiful mosaics). For more information about the island and its attractions, see our illustrated 11-page Murano travel guide. On Murano, you'll have a choice of boat stops. We'd suggest getting off at Colonna or Faro and following the canals to the center. Murano is a small island, and it's hard to get lost. If you're in a hurry and just want to see the Glass Museum and the Basilica, stay on the boat until either Navagero or Museo. It's only a few minutes from Murano to any of the stops. Finally, the line 6 "Diretto Murano" boat service runs from the Piazzale Roma and the Venice railroad station to all of the Actv stops on Murano. This boat is handy if you're coming from the mainland. Travel time is about half an hour, depending on where you board and get off.